Fair. 1451639619 **LIQUID DAMAGE ON EDGE OF PAGES BUT IN READABLE CONDITION wear on edges and corners crease on cover staining on edges of pages creasing** Your purchase benefits those with developmental disabilities to live a better quality of life. I had read this book when I was still in college and had read it again and again. 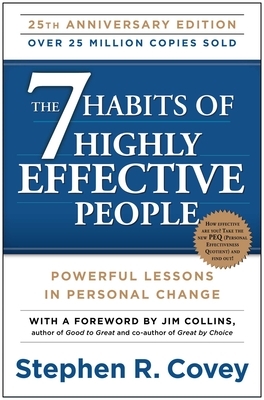 The book is easy to read unlike other self-help books who just jot down all the dos and don'ts and leave it that way. But with Stephen Covey's book, it's different. It started with examining your inner self and then gently emerging as a public person that you want to be. It also includes concrete examples provided by the author himself so that it appeals to be true to life, not some whimsical sort. This book had been my "bestfriend" for years in college. Even if I just have to visit our library just to read this book, I don't really care because I know that the fruit of my effort in applying the principles written in this book will be worthy someday.I didn't wait after college to see the result. This is the most influential book in my life....Read the book and see the effects it will bring to you..
Good book. Encouraging for any business beginner and leader to be. It's morals and justification extends to tips for family sucess.